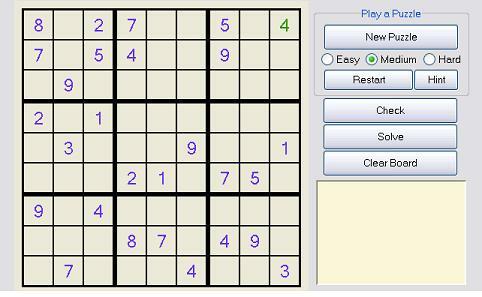 The classic Sudoku game is currently very popular in newspapers. You are given a 9x9 grid, and the goal is to have every column, row, and 3x3 grid (marked by black lines) contain the numbers 1 - 9. First select easy, medium, or hard. Then press "New Puzzle". Use the left mouse button to change the number of a square. You can use the right mouse button to get a better view of the column/row/3x3 grid that you are currently working on. You can use the "Check" button to check for errors. "Solve" will automatically solve the board. Pressing the "Hint" button will fill in a square for you.